Britain will be hit by a week of snow and freezing temperatures as the country’s “yo-yo” weather continues. There are fears the plummeting temperatures could endanger the health of the elderly and vulnerable and cause travel disruption as the snow showers are expected to hit during this morning’s rush hour. The Met Office has issued an amber “be prepared” snow warning covering large swathes of Britain, from Liverpool Bay across to the Humber to the western side of the Welsh mountains. Met Office forecaster Simon Partridge said: “We have got snow falling in a number of areas in the North and West, including thunderstorms. “There is thundersnow to the north of Manchester - these are normal thunderstorms but with snow rather than rain. The lightning on the white flakes is quite dramatic. “The snowfall is going to continue throughout the night. In the amber area we could see more than 5cm of snow, and more than 15cm on higher ground. “Quite a few places will be seeing heavy snow showers during the morning’s rush hour. 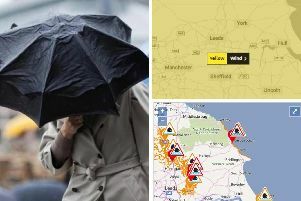 This is expected in the north west of England, on the M6 north of Cheshire and over Scotland. Forecasters warned there was a chance snow could hit as far south as Greater London. Cold blasts from Greenland and Iceland will send the mercury plummeting to around 2-3 C in the North and 4-5 C in the South today. Showers and overnight frosts also bring the risk of icy stretches forming on untreated surfaces, while strong winds will accentuate the bitter cold feel. The weather will turn slightly milder on Friday, reaching up to 7C in the South. Snow is predicted to hit the north of Scotland and Northern Ireland on Saturday, and is expected to spread down both sides of the UK on Sunday, hitting western Wales, south-west England, east Anglia and the east coast of England. Temperatures will struggle to get above freezing in parts of the North on Sunday. Health experts warned of the possible dangers and urged the vulnerable to stay warm and not to take unnecessary risks. Dr Angie Bone, head of extreme events at Public Health England, said: “Parts of England are really going to feel cold for the next few days so it’s really important people take extra care when out and about. “It’s worth remembering that most outdoor slips, trips and falls in weather like this are of those who are of working age, accidents can happen to anyone. So if you’re heading out, wear lots of thin layers and shoes with a good, slip-resistant grip. “If you’re staying indoors, have plenty of warm food and drinks to stay warm. Try to maintain indoor temperatures to at least 18C, particularly if you are not mobile, have long-term illness or are over 65 and check weather forecasts and plan your day around them. “Also take some time to think about how the bad weather may affect your friends and family, particularly if they are older or very young or have pre-existing health conditions. These groups can be particularly vulnerable to the ill-effects of cold and it’s important we all do what we can to protect those around us. “The wind could cause the snow to drift, leading to some pretty horrible and potentially treacherous driving conditions, so allow extra time for your journey and heed any police advice about whether it’s safe to travel - you may need to delay your journey.